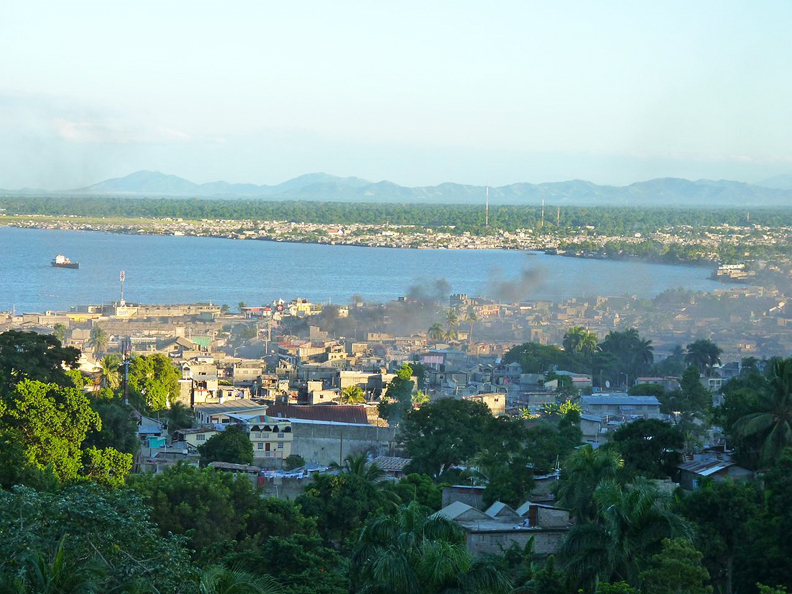 ‘All elements of society are participating’: impressions of Cap Haitien’s movement against the U.N.
Cap Haitien – The first barricade looked harmless enough. Foot-long rocks piled next to each other in a line. But as the bus driver slowed down, flying rocks landed in the street – thrown by youths crouching in the bushes up the hill. “We don’t really have a country! The police don’t do anything!” a nun sitting across from me complained after the bus driver negotiated, with a little cash, our way past. The man next to her said the country will always be mired in problems until a leader like Hugo Chavez or Fidel Castro takes power. We must have passed a dozen more barricades, most unmanned. After Limbe, where cholera has killed at least 100 people, we came to the biggest “barikad” yet in the highway. Thick trees lay across the road and hundreds of people, a few holding machetes, blocked the way. The bus driver once again descended to negotiate, but didn’t appear to be making any progress. Most passengers grabbed their belongings and got out. MINUSTAH is the acronym for the U.N. peacekeeping mission. As I stepped off the bus, people standing at the road called me over and urged me not to go. It was the third day of so-called “cholera riots” against foreign troops blamed for introducing the disease into the country. Someone said the protesters are violent “chimere,” a word for political gangs. I explained that it’s my job as a journalist to go talk to them. Then two Haitian journalists who were on the bus pushed their way through the crowd and wrapped their arms around me. Everyone agreed, finally, that together with the two guys I could get through the barricades. Elizer and Duval were coming back home to Cap Haitien. They were scared for me, saying under no circumstances should I talk with protesters or take photos. I reluctantly agreed to follow their instructions. I wondered if perhaps the U.N. peacekeeping mission was right in saying these were protests were organized by a politician or gang. 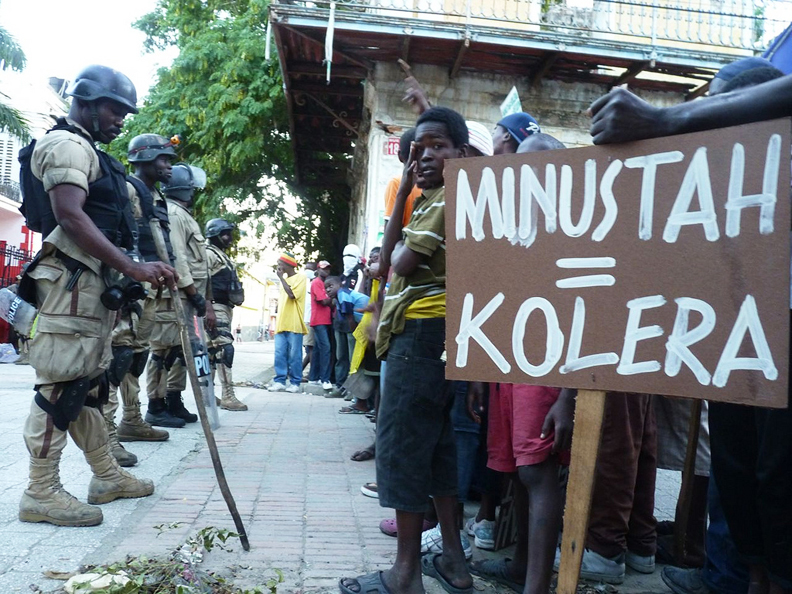 “Enemies of stability and democracy,” MINUSTAH mission head Edmond Mulet called them. So far, I’d only seen young men in the street. I yelled back, “Non, mwen se yon journalis Amerikan.” The suspicious stares softened into smiles and understanding looks. After passing the third barricade that way, we started laughing. One teenager who threw a rock at us as we approached on motorcycle said, “Pa gen pwoblem” – no problem – after I held out my press badge. As we arrived on the outskirts of Cap Haitien proper, the streets were deserted except for people gathered around barricades. One was still flaming. At another, dozens of men milled around a burnt out car. “Press! Press!” I called out, and they beckoned me through the crowd, many hands pushing me forward until I was through. I was glad when an elderly man walking in the street stopped me. I finally had a chance to do an interview, against the advice of my companions. I whipped out my audio recorder. He was Amos Ordena, the local section’s elected Kazek – an official dispute mediator. Asked if the protests are by a single group or the general population, he said all elements of society are participating in “the movement.” He said MINUSTAH are not firing weapons in self-defense, in the air to disperse protesters, but firing at people. He heard that at least one person had died earlier in the day. We finally turned off the main road and walked into an alleyway. Elizer’s modest home was at the end. He lost his wife, children and house in the capital in the earthquake. One of his brothers, blind and handicapped, lay on the floor beneath a television showing a soccer match. He smiled and introduced himself when I walked in. Elizer reminded me to use hand sanitizer. Then his frail mother, beaming at us, served us fresh mais moule (corn) and papaya juice. A neighbor of Elizer called up TV reporter Johnny Joseph, who came to meet me and help me get to the house where I was planning to stay. Elizer refused to accept any money for all his trouble. He said irresponsibility by the leaders of the country had led to this situation. In a more developed country, without so many young unemployed people in the street, the protests might have been more peaceful, he said. Johnny and I hopped on a motorcycle taxi, taking backstreets to bypass the barricades. We passed a 5-foot deep trench dug in a narrow dirt road. Johnny said a MINUSTAH vehicle fell into the trench Wednesday and people threw bottles at them. The troops opened fire, killing an innocent bystander, whose body was taken downtown, he said. MINUSTAH blamed the death on local gangs. At one junction, a young man in a purple shirt and black cap blocked our path and stuck out a knife as his friends looked on. I realized my press badge was tucked into my shirt. I pulled it out as Johnny talked the man down. “You need to have your badge out,” the young man told me, glaring. “It’s a principle.” That’s been the only instance of serious hostility directed at me since I arrived in Cap Haitien. He doesn’t use that adjective to describe the actions of U.N. troops, accused of killing at least three demonstrators since Monday. “They shot many people. We took them to the hospital. We’re asking MINUSTAH to leave the country,” a middle-aged man who declined to give his name told me. Another of Watson’s reports claimed that Christian missionaries were forced to speed on a bus away from out-of-control-mobs, like in a Hollywood-style chase scene. High drama = high ratings. As I walked toward the downtown’s central public square on Wednesday, finally nearing the house, I saw several dozen people facing Haitian police in full riot gear standing in their way. They said they had no beef with foreigners generally – only MINUSTAH. Theodore Joel said they respected the Haitian police, because they’re brothers and family – though two police stations were reportedly set on fire during the first day of protests. Thursday marked 203 years since the Battle of Vertières, where Jean-Jacques Dessalines led the final major assault on French armies to drive them off Haitian soil. They renamed the city: from Cap Francois to Cap Haitien. While many expected demonstrations to continue in commemoration of Haiti’s independence struggle, the streets were quiet. No further confrontations were reported. I walked around downtown Cap on my own, trying to find an Internet connection to send out a radio story. I’m asking everyone I meet here – from local journalists, vendors, men at the barricades to a local magistrate – if these protests were organized by a gang or political group. The unanimous answer is no. People are fed up with U.N. peacekeepers, and the cholera outbreak is the straw that broke the camel’s back. The magistrate said he understands and respects the people demonstrating, but he wishes the barricades weren’t impeding the transportation of medical supplies to fight cholera in his commune, where people are dying in the street. As the head of MINUSTAH warned that “every second lost” because of protests means more suffering and death from cholera, the anti-U.N. demonstrations continued in Port au Prince on Thursday. Again, the protesters are the ones implicated in the violence. But a timeline report released by International Action Ties, an independent human rights monitoring group, said the demonstrations were largely peaceful after returning to Champs de Mars plaza. U.N. troops and Haitian police fired at least 30 tear gas canisters into the Faculty of Ethnologie and surrounding tent camps, the report said, sending children and old women fleeing into the streets. Police ignored the group’s pleas to stop firing. Are protests against the U.N. meant to destabilize the country? Are Haitians who’ve taken to the streets being used, like puppets, by powerful politicians for their own ends? Are the protests violent? The foreigners I’ve talked to say yes. A few American liberals living in Haiti tell me they fear the protests are violent and meant to cause chaos, echoing the statements of MINUSTAH and reporters like Watson. Some Haitians in the professional middle class don’t want to participate. But most Haitians I’ve spoken with say no. They say this is the inevitable outcome when troops who operate in Haiti with seeming impunity may have introduced a deadly, misery-multiplying disease into the country. It’s an angry, popular movement – protesting however they can, emotions running high – against a 5-year-old foreign occupation. Most Haitians I’ve spoken with say protests are the inevitable outcome when troops who operate in Haiti with seeming impunity may have introduced a deadly, misery-multiplying disease into the country. It’s an angry, popular movement against a 5-year-old foreign occupation. What do you think? We’ll see how this plays out in the next nine days, ahead of the Nov. 28 election. Stay tuned. Ansel Herz is a 22-year-old freelance journalist based in Port au Prince, Haiti, since September 2009. “My goals,” he says, “are to advance media justice and ‘go to where the silence is.’” He reports for Free Speech Radio News, KPFA’s Flashpoints and many other media, including his website, MediaHacker.org, where this story first appeared, and can be reached at ansel@riseup.net. Juan Gonzalez: Protests are continuing in Haiti over the cholera outbreak that has now killed over 1,100 people and infected more than 17,000. 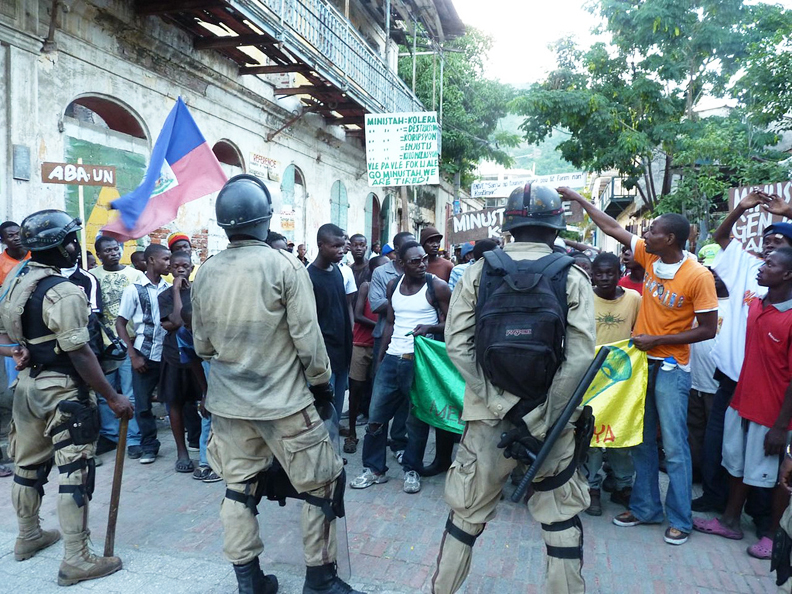 On Wednesday, residents in the city of Cap Haïtien clashed with U.N. troops for the third consecutive day. Crowds have taken to the streets expressing anger at the Haitian government and the U.N. for failing to contain the disease. 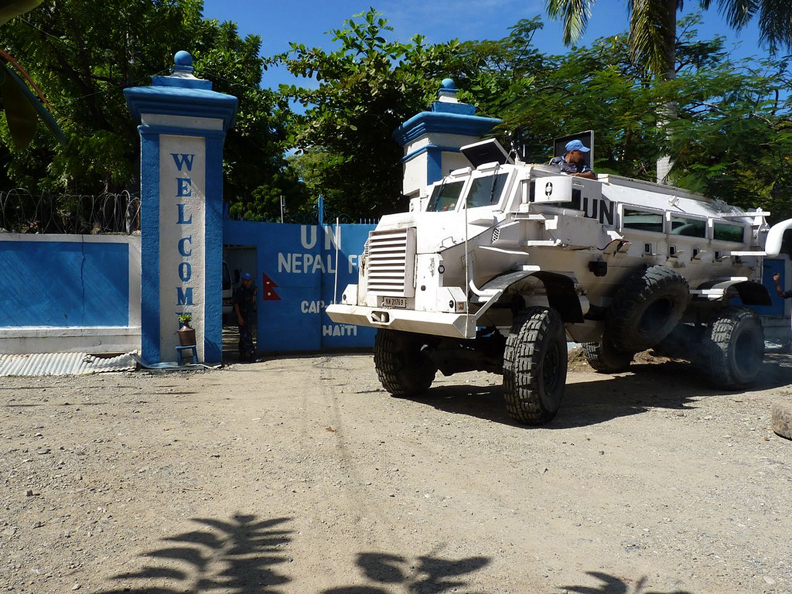 Nepalese U.N. troops stationed in Cap Haïtien have been accused of inadvertently bringing cholera to Haiti. The protests reportedly started at a cemetery where cholera victims were being placed in mass graves. At least two people have been killed in clashes between demonstrators and U.N. troops. On Tuesday, the U.N. Mission in Haiti, known as MINUSTAH, said aid flights have been canceled and water purification and training projects curtailed, while food at a warehouse has been looted and burned. Amy Goodman: The Pan-American Health Organization told Agence France-Presse that the cholera outbreak could kill as many as 10,000 people and cause 200,000 infections in the coming year. Meanwhile, the disease has spread beyond Haiti’s borders. The Dominican Republic confirmed it had detected its first case of cholera, and officials in Florida have confirmed the first case in the United States. For more, we go to Haiti right now to speak with independent journalist Ansel Herz. He’s in the city of Cap Haïtien, where the protests are taking place. Ansel, welcome to Democracy Now! Tell us what’s happening in Cap Haïtien. Ansel Herz: Right now, I’m stationed in the downtown public square here in Cap Haïtien. It’s the second largest city here in Haiti on the northern coast. And things are – appear to be pretty calm here in the downtown. Today is actually a holiday. It’s National Flag Day, and it commemorates a huge battle that was waged in 1803 in Haiti’s independence struggle. But as I came into the city yesterday, there were barricades almost every couple hundred of yards on the main highway coming into Cap Haïtien. There were young men, as well as women, around a lot of these barricades. I had a few rocks thrown at me. But as I got closer, I flashed my press badge, and I tried to make clear that I wasn’t with the U.N. peacekeeping mission, and immediately I was sort of hustled through a lot of these barricades. And they’re actually still in the streets. A lot of them are not manned at the moment. But people are saying that because today is this national holiday commemorating Haiti’s independence struggle, they expect the protesters to come out again in the next few hours. And I’ll add, too, that reportedly a third person has been killed by U.N. troops here in the city. That happened yesterday. 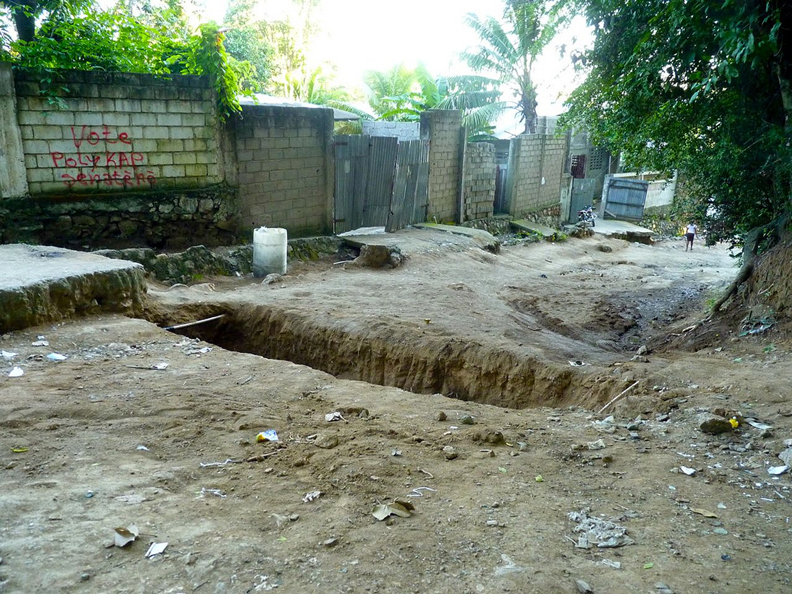 I actually went by a back street here in Cap Haïtien, where protesters had dug a trench as a barricade, basically, and a MINUSTAH vehicle, a peacekeeping vehicle, fell into the trench. And I’m told by witnesses and by Haitian journalists here that when the vehicle fell in, Chilean peacekeepers sort of came under attack, I guess, or a barrage of bottles, rocks – the population – and that the troops responded with gunfire and shot an innocent young man just in his house. And so, reportedly, they took his body over to the mayor’s office, actually, and left it there. And again, meanwhile, there are still barricades here in the street, and some of them are actually made of coffins, and protesters told me that there are cholera victims inside. Amy Goodman: We’re asking listeners and viewers to bear with the phone sound, but we just think it’s absolutely critical to get this information out of Cape Haitian, or Cap Haïtien. Juan? Juan Gonzalez: Well, Ansel, I’d like to ask you, in terms of – it’s clear that the U.N. peacekeepers, if they were the source, and likely they were, of the outbreak of the cholera, didn’t do it deliberately, but there has been a growing resentment for years now among the Haitian people to U.N. – the presence of U.N. peacekeepers. Can you talk about the roots of this animosity? Ansel Herz: Sure. I mean, it’s been interesting to see how the U.N. here has responded to these riots, because they – and protests, because they’ve actually claimed that people are sort of being manipulated and that it’s not a legitimate sort of spontaneous political movement. But, of course, I was here in this city a year ago, actually, and I was interviewing people on the street, and they were telling – there were protests at that time, peaceful protests, against U.N. peacekeepers. And they were telling me that they were tired of an occupation in their country, that the peacekeepers have an enormous budget, but very little of it is spent on, you know, concrete humanitarian activity that could actually improve education and healthcare in this country. And, of course, also, back in August, a young boy, a 16-year-old boy, was found hanging from a tree inside a U.N. peacekeeping base here in Cap Haïtien. That’s a story that’s been totally ignored by basically the entire U.S. media. And U.N. troops claim that he committed suicide. But people just across from the base at a hotel said that they heard his screams. They heard that he was being strangled. And there’s a lot of suspicion that he was, in fact, murdered by peacekeepers for maybe stealing a small amount of money. And then recently a group of civil society organizations wrote a letter to the U.N. peacekeepers demanding an independent investigation and condemning what they called the U.N.’s obstruction into justice for that case. 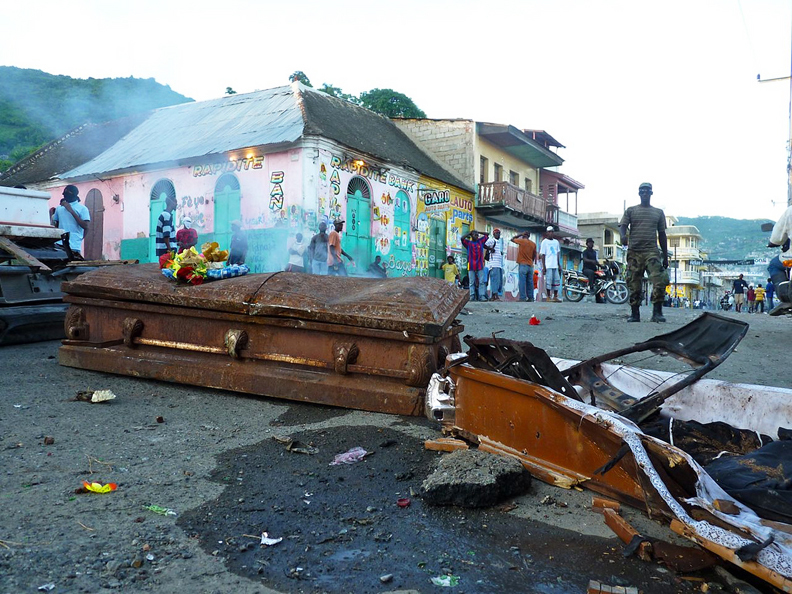 And after that death, there were weeks of protests, peaceful protests, here in Cap Haïtien. So, the idea that these are sort of manipulated protests, that people are being used, I think, doesn’t hold water. There have been longstanding accusations against the peacekeeping mission here for abusing Haitians and for lacking transparent investigations into any of these alleged human rights violations. Juan Gonzalez: And what about the upcoming elections and the difficulty of holding an election, given the calamities that have befallen Haiti in the past year? Ansel Herz: I mean, there was a recent report from CARICOM that thousands and thousands of people who died in the earthquake are still on the voter rolls. Of course, the cholera epidemic is spreading. It’s been epidemic, basically, throughout the country. It was allowed to spread out of the central region where it began and is now in all 10 of the provinces. And, you know, even before the cholera outbreak began, you had very regular protests in Port au Prince by people in the tent camps, people who have been displaced for the past 10 months, who lost their homes in the earthquake and have not been given any kind of new housing. And their rallying cry, again and again, has been “We are not going to vote while we’re under tents and tarps.” And so, I think the prospects for holding credible election, where you have a considerable participation, are pretty low. Of course, one of the largest parties in the country, Fanmi Lavalas, the party of the ousted president Jean-Bertrand Aristide, who was overturned in a 2004 coup, that party is being totally excluded from the election on what would appear to be just political grounds. And it’s been part of excluding that entire movement since Aristide was ousted. And so, I just think this election is likely to be a sham affair. And yet, the candidates, as well as the Haitian government itself, are insisting – and the United Nations, as well – are insisting that this election is going to go forward on Nov. 28. Amy Goodman: Finally, again, the United States holding back more than – the U.S. Congress is holding back more than a billion dollars in aid to Haiti. What is the effect of this, Ansel? Ansel Herz: Well, the effect is that you have at least 1.3 million people still living in these – in tent camps, where independent studies by the Institute for Justice and Democracy in Haiti, as well as others, have found that, you know, 30 or 40 percent of these camps don’t have any regular clean water, don’t have toilets. And so, you know, I’ve heard people say that Haiti is unlucky to be hit by cholera, that it’s somehow the sort of a tragedy that couldn’t have been prevented. But the fact is, you know, NGOs, private charity groups raised billions of dollars in relief funds for earthquake victims after the Jan. 12 earthquake, and very little of it has been sent. Just one example is the Clinton Bush Haiti Fund, headed by Presidents Clinton and Bush. It was inaugurated by President Obama right after the earthquake. They dispersed only $6 million out of around $50 million that they raised. And so, the continuing effect is that you just have a exacerbated humanitarian crisis on top of Haiti’s decades of poverty. And it doesn’t seem likely to end anytime soon, unless there’s a really serious reevaluation of the way NGOs, in tandem with the United Nations, operate in this country. Amy Goodman: Ansel Herz, we want to thank you very much for being with us, independent journalist, has lived in Haiti for more than a year. He’s speaking to us from Cap Haïtien, from Cape Haitian, in Haiti. Democracy Now! is a national, daily, independent, award-winning news program hosted by journalists Amy Goodman and Juan Gonzalez. Pioneering the largest public media collaboration in the U.S., Democracy Now! is broadcast on over 850 radio and TV stations, including all five stations of the Pacifica network. Listen on KPFA 94.1 FM at 6 and 9 a.m. every weekday. This segment was broadcast Nov. 18. Previous articleMumia must live and be free! End the racist death penalty! Many thanks to those that signed and please forward to others!! !